One of the major news stories of 2015 has been the flow of hundreds of thousands of migrants from Syria and beyond into Europe, and the social and political crises this has precipitated. 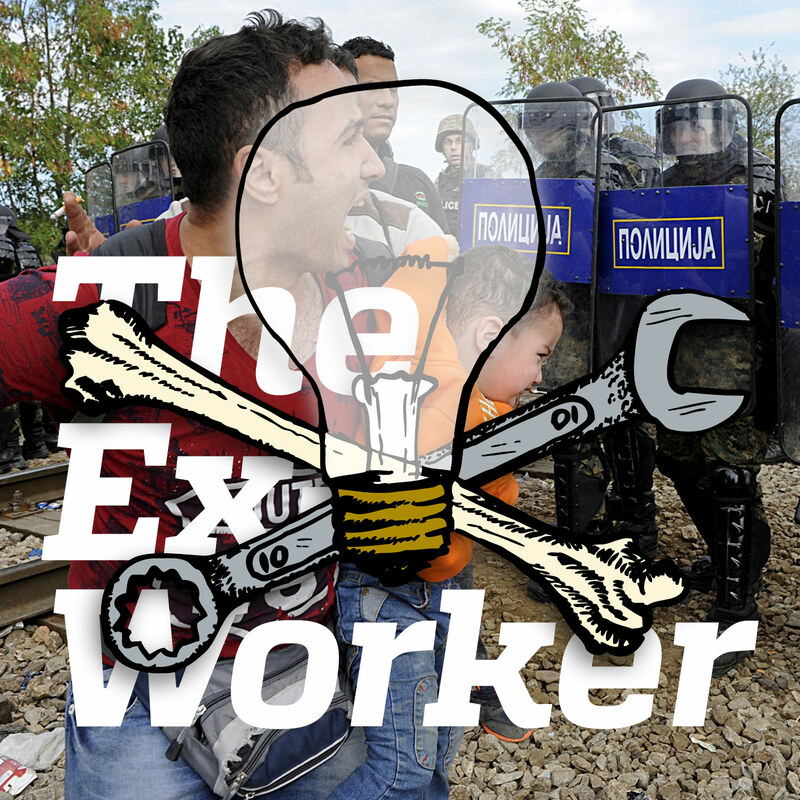 In this episode, we'll take a look at Europe's so-called refugee crisis from an anarchist perspective. To do that, we adopt a "mix tape" format, pasting together excerpts from a variety of sources to offer an impressionistic look at how and why people move across the world, the barriers thrown up by states to impede and control them, and popular resistance against the system of national borders. We begin with reflections on borders from the CrimethInc. Contradictionary, To Change Everything, and past Ex-Worker episodes, and continue with excerpts from interviews with No One Is Illegal activist Harsha Walia, author Vijay Prashad, and a Swiss anarchist active in migrant solidarity struggles in Europe, as well as essays from an activist convergence against climate change, Calais Migrant Solidarity, and Mask Magazine; and conclude with reflections on the Islamic State attacks in Paris from the CrimethInc. blog. You'll also hear updates on anti-anarchist repression in Spain and anti-government demonstrations in South Korea, a report-back from the Rebel! Rebuild! Rewild! action camp in eastern Canada, and an announcement for a new prisoner publication, plus news, upcoming events, and more. For our discussion of borders and migration, we pulled together excerpts from a wide variety of sources, including: the Contradictionary entry for “Border”, originally read in Episode 12; a section from Episode 35, our audio zine version of To Change Everything titled “The Problem is: Borders”; a selection from Episode 11’s discussion of fascism and nationalism; an interview with Harsha Walia from the Winnipeg-based anarchist radio show Black Mask; the section “Migration, borders and climate change: a ‘no borders’ perspective” from the zine “Climate change is not an environmental issue”; an editorial by Mask Magazine managing editor Hanna Hurr called “Hopelessness in a Lovely Place”; an interview with Vijay Prashad titled “Mediterranean Refugee Crisis Escalating” from the Real News Network; a statement from Calais Migrant Solidarity titled “Solidarity means fighting the border”; and a new CrimethInc. blog feature titled “The borders won’t protect you—but they might get you killed”. Some other interesting anti-border resources include the 2012 Transborder Map visually depicting a wide range of anti-border resistance projects in Europe; the No Border Network’s “Crossing Borders” transnational newsletter, with eleven issues published between 2006 and 2013; and the websites from European No Border Camps, including Brussells in 2010, Cologne in 2012, and Rotterdam in 2013. For more info on Operation Pandora and other anti-anarchist repression efforts by the Spanish state, see this basic update in English, this statement from the arrestees, and The Final Straw Radio show, which is posting a show featuring the full interview with a Spanish anarchist from which we shared a short edited segment. There’s a new prison-themed publication called “Unstoppable” forthcoming; check it out! We shared a reportback from the Rebel! Rebuild! Rewild! eco-anarchist action camp in eastern Canada. Also, follow these links to learn more about how to support resistant prisoners Amazon from Gender Anarky, Keith Lamar, and Niara Burton. We reported last episode on the upcoming sentencing hearing for animal liberation activist Tyler Lang; his hearing has been rescheduled for December 18th. So if you’re in the Chicago area and can make it to the hearing, please come out and show your support. You can get details and updates at supportkevinandtyler.com.